A few good months after its introduction, the Augmented Reality navigation feature is finally rolling out for Google Maps users in the wild. However, this is only a test run that includes a limited number of users and there is no official date for the general rollout of this next-gen feature. Although it is usually a very helpful tool in most cases, Google Maps navigation can be quite confusing sometimes. 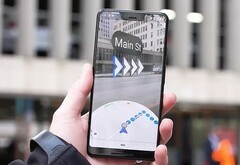 Last year, Google unveiled an Augmented Reality navigation mode for Google Maps at the I/O conference. Now, this feature is finally rolling out, but there is also a catch: for the time being, we are talking about a limited test. David Pierce from The Wall Street Journal is one of the chosen few who are currently testing the aforementioned Google Maps feature and he thinks that this "isn’t likely to be your primary turn-by-turn option, it’s a huge step in the right direction for Google Maps." With the AR navigation feature, Google Maps uses Street View data and the GPS location to track the position of the user as accurately as possible and then displays arrows and directions on the screen as if they were drawn onto the real world. Obviously, using AR navigation will also draw the battery much faster than the regular Google Maps interface, since AR navigation involves drawing 3D-accelerated objects and continuously using the main camera of the device as well. This feature is better suited to AR-capable glasses, but — at least in certain situations — it can be really helpful for smartphone/phablet/tablet users as well. Would you use AR navigation once it becomes available in Google Maps or the existing interface is more than enough for your needs? Let us know what you think in the comments section, as usual.